Publications offered for purchase from the Society and its close friends. Judy Hildreth has published a series of books of birth and death records pertaining to neighboring Calhoun County. Read More... | 2411 bytes more | Comments? 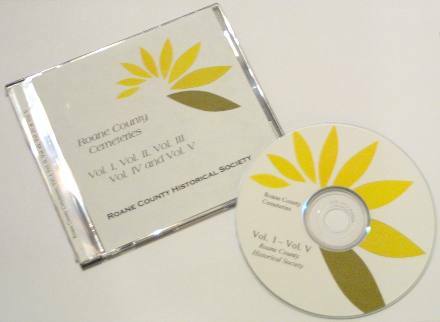 The 5 volume series, Cemeteries of Roane County West Virginia, is now available on a single DVD-ROM, containing searchable PDF (portable document format) versions of all 5 volumes. Originally published in 2001, this series features updated readings of Roane County Cemeteries. Each volume has approximately 200 pages plus index. In addition to marker readings, each cemetery has notes on location, and any additional or differing information available from the older WPA readings is noted. Read More... | 1525 bytes more | Comments? The Roane County Journal is a quarterly publication of the Roane County Historical Society. Society members know the joy of finding the latest issue in their mail boxes. Each 24 page issue of the Journal is filled with articles which may include Roane County history, census records, marriage records, birth and death records, photos, family histories, maps and queries from other Roane County researchers. The current Journal year is Volume 17, and a brief summary is provided below. If you are not a member, join today to receive the future issues of this volume, along with the back issues for the year that you have missed out on. For information on obtaining the Journal from previous years, click here. The Roane County Historical Society, in conjunction with his widow Kay Craig, has for sale a limited quantity of the final book of W. Frederick Craig, who died in 2008. Read More... | 1107 bytes more | Comments? Judy Hildreth has announced the availability of several new Roane County books, Births (late 60's to May 2008) Volumes A-L and M-Z, and Out of County Deaths 1979-2008. Read More... | 299 bytes more | Comments?